Before you can deploy a blueprint, you must upload the blueprint to the Cloudify Manager. You can upload a blueprint using the CLI. You can also upload using the Cloudify Console. Either use a blueprint that you have written or download an example blueprint to upload. You can upload a pre-packaged blueprint archive through the Cloudify Console in tar, tar.gz, tar.bz, or zip formats. On the Blueprints Catalog widget in Cloudify Catalog page, click Upload. Enter an unique name for the blueprint. For example, you can upload one instance of the blueprint as blueprint-template and another instance as a blueprint-with-input. Select the YAML filename of the blueprint. This field refers to the .yaml file that contains the application topology. Click Upload to upload the upload the blueprint package. From the Cloudify command-line interface, you can upload your blueprint to Cloudify Manager. You must specify the path to a blueprint file. Download the cloudify-nodecellar-example as a ZIP file. Copy the ZIP file to your Cloudify Manager. Extract the ZIP file to a directory. In the CLI of your Cloudify Manager, change directory to the cloudify-nodecellar-example directory. The -b flag assigns a unique name to the blueprint on Cloudify Manager. 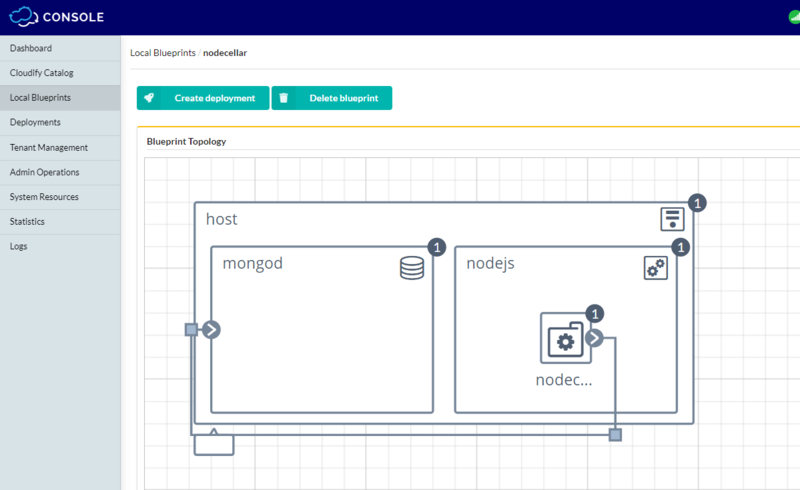 You can navigate to the Cloudify Manager URL and see the nodecellar blueprint in your list of local blueprints. You can now deploy your blueprint.